Signals are weaker in through-the-air communications - sometimes by several orders of magnitude - than in more familiar situations where an optical signal is to be detected from optical fiber systems such as optical fibers, TOSLINK, infrared TV remote, etc. : In these situations, the energy present at the receiver is really quite high, suffering only modest attenuation through the medium. Unlike variable, atmospheric paths, optical cables fibers tend to have consistent signal levels. Even infrared remotes, while more-variable, are usually pointed directly at the device being controlled and have fairly high signal levels. Bandwidth requirements can be more modest over long-distance, through-the-air communications paths. For weak-signal detection in through-the-air optical communications and experimentation, voice bandwidth (up to 3 kHz or so) is usually all that is required, while specialized communications techniques (carrier detection, WSJT and WOLF modes) work well with frequencies below 300 Hz. With the above in mind, the optical receiver was designed to meet those needs while, at the same time, being constructed using fairly easily-obtainable components using conventional techniques. This receiver is intended to detect amplitude-modulated light from a distant transmitter, "baseband" modulated with plain speech and what is depicted in Figure 1 has not been optimized for use with subcarriers or other signaling techniques above 5 kHz or so. If you intend to use this receiver for higher frequencies for subcarriers, etc., please refer to the notes about use at higher frequencies farther down this page. "Why not use (fill in the blank) detectors instead of photodiodes?" There are a number of other technologies available that may allow even better "weak signal" performance than standard silicon PIN photodiodes - such as Photomultiplier Tubes and Avalanche Photodiodes. While these technologies exist, the intent was to come up with a design that was both inexpensive to build and easy to replicate. Having said this, these more-exotic devices (PMTs and APDs) occasionally appear on the surplus market for reasonable prices and experimentation using such devices is certainly encouraged! Receivers for low-bandwidth optical (through-the-air) communications - This page discusses several different low-bandwidth receiver topologies and includes much of the information found on this page. Modulated Light DX Receiver Circuitry - This article, by Mike Groth (VK7MJ) and Chris Long (VK3AML) talks about various aspects of optical receiver design. This article also includes a reproduction of Application Note D3011C-3 by EG&G that covers, with somewhat more rigor, the various properties of photodiode-based detectors. Other related articles are linked at the bottom of this page. Simplified version of the "Version 3" optical receiver - see text. No feedback is used. This avoids the contribution of additional noise energy at the lowest-level signal portions of the circuit - namely the "hot" side (anode) of the photodiode. D1, the photodiode is reverse-biased. This is done to reduce the diode's capacitance and maximize high-frequency response. Q1 and Q2 form a "cascode" amplifier circuit. This simple circuit not only provides a significant amount of AC gain, but it also minimizes the effects of "Miller Capacitance" - that is, the effect of the gain of Q1 seemingly to amplify the effects of its gate-drain device capacitance. Q3 is a current source, providing the majority of drain current for Q1. Being a current source, it has a fairly high impedance (as opposed to the use of a plain resistor to supply the same amount of current) and it adds minimal noise to the circuit, and by running the FET with more current, it tends to be quieter. A bonus is that this current source makes the circuit somewhat less-sensitive to power-supply variations. To compensate for the high-frequency rolloff of the photodiode, U1B is configured as a differentiator to provide a 6dB/octave boost. This results in a fairly flat audio response over the speech range. Additionally, the differentiator circuit itself includes a mechanism to provide low-pass filtering above 6-7 kHz or so. The value of the bypass capacitor in the cascode amplifier (in this case, C4 - 2.2uF) should be chosen with care: If very large values are used, low-frequency oscillation or "ringing" may occur - particularly at higher supply voltages (e.g. >12 volts) and/or with large, rapid/transient changes in light. Comment: The circuit depicted in Figure 1 differs from the prototype "Version 3" mentioned on the aforementioned web page only in that is does not include an extra low-pass filter stage, and or an "active decoupler" in the power supply, the latter not having found to be necessary when the receiver was operated from its own, isolated 9 volt battery power source. This circuit is intended to be operated from its own, single 9-volt battery - which is one of the reasons why the reverse-polarity protection is present in the form of TH1, a self-resetting thermal fuse, and D4, a reverse-polarity protection diode: It is extremely easy to momentarily connect a 9-volt battery backwards while fumbling in the dark - something that could instantly destroy U1. In order to maximize the available voltage, a series protection diode was NOT used! While the use of an LM833 is shown in the diagram, practically any dual op-amp with "reasonably" low-noise specifications may be used, including the venerable TL082/TL072: A 1458-type op amp was tried, but it was found to be quite noisy. Note that operating an LM833 (and many other common dual op-amps) from a single 9-volt battery pushes the low voltage specification of this device - which is listed as 10 volts: Testing has indicated that the LM833 units that we have seen seem to operate reasonably down to at least 7 volts, but this is not a guaranteed specification! If you are constructing this circuit, keep in mind that there are many other op-amps that offer good, low noise performance but can operate from much lower supply voltages, such as the LM4562 or the LMC6482, to name but a few! In Figure 1, note also the presence of S1, a "gain" switch across U1B. This switch is optional and is present to accommodate both situations where signals are very strong (such as with shots over just a few miles) and also those in which signals are very weak, close to the noise floor of the receiver. Of course, this added gain (about 20dB) does nothing to improve the actual sensitivity of the receiver, but it can bring a low-level signal up to the range where one's audio amplifier and monitor/recording system can properly operate! Note also J1: This jumper is used to short out R4, the resistor in the source lead of Q1. This 10 ohm resistor (and C3) is present solely for the purpose of measuring the source current through Q1 and, after final adjustment, should jumpered . Finally, note that this circuit is designed such that gate current can actually flow through D1 and into Q1! This is a rather peculiar way to run a JFET, but this quirk allows the establishment of a reverse bias across D1. Operation in high ambient light. If daylight operation is anticipated, it should be noted that the photodiode (D1) may conduct excessively and strongly bias the JFET. If such operation is anticipated, one of the easiest things to do is to simply make the reverse bias voltage variable by placing a potentiometer (50k-100k will do) across the power supply and connect the "V+" and of R1 to its wiper. It is likely that such a bias adjustment will be "touchy" at the low end of the bias voltage range, so it is recommended that a fixed resistor of 1/3 the potentiometer's value be connected from the wiper to the "V+" end to "stretch" out the adjustment. Alternatively, a logarithmic-taper potentiometer could be used: Just wire it so that the "stretched" portion (e.g. least amount of resistance change per degree of rotation) is at the "low" end of the bias adjustment. If you happen to have a 50k-100k multi-turn potentiometer, you could use that, too! If the bias is set too low - especially under "dark" conditions, the JFET may have too little bias for the rest of the circuit to work as evidenced by the receiver seeming to be "too quiet" and very deaf. If this happens, simply set the bias to maximum and then reduce it as necessary. If a device with high leakage is used in lieu of a PIN photodiode such as an LED. Some experimenters report good results from reverse-biasing certain types of LEDs to bring about a latent "Avalanche Photodiode" mode of operation and it is likely that the leakage currents involved in such could saturate the JFET. Daylight modifications will dramatically reduce the absolute sensitivity of the receiver. While this isn't likely to be important for daytime operation where the sun's thermal noise is likely to be orders of magnitude higher than the receiver's noise, it will impact nighttime use under low-light conditions. In other words, it's best to build a separate "daytime" receiver! This will affect the standing current of Q1, the JFET. Chances are, with the gate voltage being reduced that it will be conducting less-strongly! Because of this you will likely need to reduce the JFET's current which should be done by increasing the value of R5! Failure to do this may yield inconsistent results! Except, perhaps, in testing, do not use a variable resistor for R5 as the wiper noise can be extremely high! A less-desirable alternative would be to use a resistor between the emitter of Q3 and ground to sink more current, but here, again, using a potentiometer is risky! If this is done, it is recommended that a metal film resistor be used for the reasons mentioned below. The "gate leak" resistor should be as high a value as is available. Unfortunately, 10 Megohms is about the highest commonly-available value, although 22 Megohm units may be found. If exclusively "daylight" operation is expected and additional resistors are used to bias the photodetector, it is recommended that all of those resistors be metal film as well! Having said that, it is more likely that the noise from the leakage of the photodetector (not to mention the light itself!) will exceed the noise contribution of these resistors - even if they are not metal film! With the use of the cascode circuit consisting of Q1 and Q2, signals from the photodiode, D1, are expressed mainly as variations in the drain current of Q1 and are reflected as changes across R6. In order for this circuit to work, however, it is necessary that the standing current through Q1 be properly set. Because of the circuit topology, there positive gate-source voltage with a small amount of gate-source current flowing. As you might expect, this fully "turns on" the JFET - but there is still plenty of "room" for the JFET to do its work. This odd operating condition (that is, with the JFET conducting gate current) also requires some care in the proper selection of the drain current in order for the circuit to work properly! Q3 is the primary current source for the JFET, Q1, and as such it has a fairly high intrinsic impedance (perhaps 10's of k-ohms) with the standing current set through the selection of R5, nominally a 120 ohm resistor. If the current is too high for the particular transistor used for Q1, the gain and performance is greatly reduced - a condition obviated by the voltage at the drain of Q1 being within a volt or two of the positive supply rail. In general, it is better to run the JFET at a current that is slightly "too low" than slightly "too high" as the penalties for running slightly "low" current (slightly degraded S/N ratio) are less severe. For the typical 2N5457 from the various sources onhand, an R5 value of 120 ohms seems to be about right, resulting in consistently "good" performance - but this cannot be guaranteed! If a less-tightly "spec'd" JFET is used (such as an MPF102) then one may need to do some experimentation to find the "optimal" value for that specific device. In experimenting, some MPF102's of various manufacturers and vintages were tried and while some devices simply did not work properly with R5 set at 120 ohms, none needed higher values (which correlated with lower drain current) than the 180-220 ohm area. 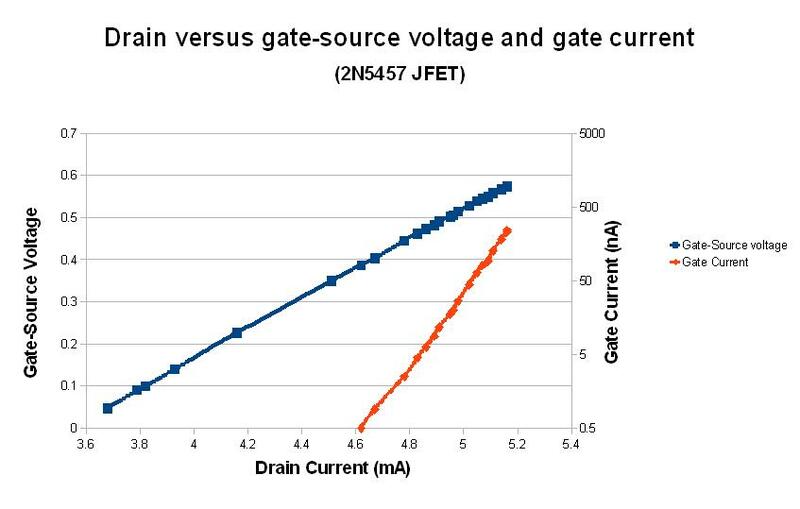 One property of JFETs is that the more drain current you can run through them, the "quieter" they can become - up to a point - a phenomenon having to do with "bulk current" effects - and because of this, best performance (e.g. best signal-noise ratio) is obtained at higher drain currents. Again, if you go overboard and run too much drain current, the device is simply saturated and performance suffers. Another device with which good success has been obtained is the Philips BF862. This JFET, available only in a surface-mount package, is quite remarkable in its combination of having fairly high transconductance, moderately low gate capacitance, and high drain current capabilities and in testing it operated well with drain currents ranging from just a couple of milliamps to well over 20 milliamps! Of course, the same advice applies as with other JFETs in terms of optimize performance with the proper selection of drain current. It is worth mentioning that Q1's drain voltage can vary widely - but it is better for it to be low (as low as 1 volt or so - or even below 0.25 volts for a JFET like the BF862) than high (close to the positive supply rail) for the simple reason that the cascode circuit (Q2) requires several volts of drop across it to function. Since it is the drain current that is being used to convey the signal, one should not be too surprised by the absolute DC voltage at that point: In fact, monitoring the drain of Q1 with an oscilloscope is unlikely to reveal much voltage change at all - again, due to the fact that it's a change of current that is occurring and that the signal is likely to be very small, anyway as that's the whole point of a cascode circuit! Finally, these components (the JFET, Q1, and Q3, the current source) are subject to the sorts of changes that semiconductors undergo as temperature changes. Experience has shown that when the drain current of Q1 is chosen to be a "safe" value (that is, at least 25% below the "maximum" current at which the circuit functions properly) at "room temperature" (around 20C) then it seems to tolerate temperature changes from about 0C to 35C (the maximum range over which it was tested) while functioning properly - that is, Q1's drain voltage staying adequately low to allow Q2's circuit to function - which also implies that Q1 is not being fed "too much" current by Q3. If operation over a wide temperature range is anticipated it is strongly recommended that it be thoroughly tested to make sure that Q1 is "happy" (that is, not fed too much current) over the expected temperature range. As mentioned above, "good" weak-signal performance may be obtained by setting a nominal Q1 drain current, but if you wish to eke out the very best possible performance (that is, the best signal-noise ratio) one can "tweak" to find the optimal drain current for the specific device being used. Doing this requires a simple test fixture that will provide a small but consistent optical signal and a means of looking at the receiver's output and discerning the signal-noise ratio and for this, I constructed a "photon range" in a room in my house that had no windows simply by attaching a normal red LED to the ceiling and placing the receiver being tested on the floor directly below. The LED was modulated with a square wave at the test frequency, with a consistent (but small) amount of current from a function generator - just enough to be perceived to be glowing to the dark-adapted eye. Connected to the receiver, via shielded audio cable, is a laptop PC running the Spectran program. With this program one can take measurements of the strength of the audio signal from the receiver's detection of the modulated LED and compare it with the noise floor. The room being used for testing must be completely dark! When running such tests, I even have to unplug or cover the indicator lights of devices in the room: Even that dim neon light or LED on a plug strip can cause a "roar" of AC noise on a sensitive receiver! Always run such tests when it is dark outside. Even though the room has no windows, there is enough light around doors to other rooms to skew readings. Adjacent room lighting is turned off - for the same reason as above! It is best to use a battery-powered, self-contained tone generator, if possible. Even if you use shielded cable to feed the LED on the ceiling, it is possible that enough signal will couple from that wiring into the receiver: Since the receiver being tested is very possibly a prototype, it may not be as well-shielded as it should be and would thus be more susceptible. Always place the receiver under test inside a grounded metal box. Because my "test range" is in a utility room, grounded metal pipes are nearby and provide a convenient earth ground. (My house is old enough that the water pipes are metal and really are grounded!) A simple, aluminum project box with sides a few centimeters high suffices as this is typically enough to screen the circuit from the stray AC fields that are prevalent inside a typical house! Again, this step is particularly recommended when one is testing a "prototype" circuit that may be built "dead bug" or "ugly" style and isn't well-shielded! The use of battery-operated laptop computer is recommended. Sometimes one has to have the computer "floating" in order to minimize pickup of hum and operate it without any coupling into the house's AC mains - that is, on battery! Make absolutely certain that the noise floor you are seeing on your computer is that of the optical receiver being tested and NOT that of the computer's sound card! The easiest way to verify this is to check the noise floor with the receiver powered up, and again with the receiver powered down. If you do not see a 10-20dB change in the noise floor, you may need to increase the gain of the sound card, or you may need to add yet more gain to the output of the receiver being tested! Normally, I've found that using the "Mic" input with the "mic boost" box check is sufficient. Finally, one should always do the "noise floor" test described above for every frequency at which you run tests, as the noise floor will vary with frequency! Because these are measurements based on comparison against noise, expect there to be significant short-term variations in readings. These sorts of readings often require a degree of averaging over a period of time to minimize the uncertainty to to random noise spikes. Barry, G8AGN has had excellent (and repeatable!) results in constructing and using a "Photon Tube" to analyze receiver performance. This consists of a meter or two of black ABS sewer pipe of fairly large diameter (7-10cm) with the receiver under test at one end and an LED at the opposite end. Because of internal reflection within the pipe that can effectively "magnify" the LED's intensity by reflection, it is absolutely necessary to make the interior of this pipe anti-reflective. A material suitable for this purpose is black photographic "flocking" paper specifically intended for this very sort of purpose. Unfortunately, this paper can be a bit difficult to locate and expensive, but it is well worth the effort. Somewhat less effective - but perhaps usable - is black flocking paint for a similar purpose or even flat black paint. Yet another method to reduce spurious reflections is to install a number of baffles within the pipe made from flat black material such as construction paper or cardboard. In the steps below, when setting JFET current via R5 it is absolutely important that comparative measurements be made with the photodiode in complete darkness! When optimizing a receiver, one would typically set R5 at a fairly high value (say, 220 ohms) and the parallel fixed resistors of decreasing value (typically starting at 1k-2k) noting the measured signal-noise ratio, the value of the added resistor, and the voltage across R5 for each test. At some point, further increases in Q1's drain current (e.g. lower values at R5) will start causing a decrease in signal-noise ratio. While a potentiometer may be used for R5, be warned that these devices can be extremely noisy - especially when such low signal levels are involved due to the probability of wiper noise! If a potentiometer is used, one must always measure the value and substitute it with a fixed resistor and re-check the signal-noise ratio! If you don't get as good a signal-noise ratio with the potentiometer as you did with a fixed resistor, you can guess what the probably reason for this might be! Note that "best" performance does not need to coincide with maximum gain - which is why it is absolutely necessary that one is always measuring signal-to-noise ratio! If, for example, you were to make a circuit change that caused the signal being received to drop by 3dB - but your noise floor dropped by 6 dB - your receiver is actually able to "hear" 3dB better, despite the drop in gain! One important fact is that it is better to supply a bit too little current to the JFET from the current source than too much! What this means is that with current that is on the low side, the Q1's drain-source voltage will be quite low - on the order of a volt or two at the most. If the current supplied by the current source is too high (e.g. too low a value of R5) then the drain-source voltage will rise: If this happens, the cascode has less voltage margin to work properly and this voltage is likely to be unstable, subject to the effects of temperature on the FET and the current source both - something which may make the optical receiver unusable over certain temperature ranges. The general recommendation is to determine the maximum current possible (again, with the photodiode in complete darkness) as set by lowering the value of R5 and noting the point at which the drain-source voltage starts to rise rapidly. Taking this value, R5 is than adjusted upwards in resistance so that the current is reduced by 20%-25% or so, proving a reasonable margin of safety with respect to variations of current related to temperature. How much difference in performance is there between an "un-optimized" receiver and one that is fully-optimized? That's a hard question to answer as it's impossible to know how good or bad an "un-optimized" receiver really was. In testing several receivers, the most S/N improvement that was obtained was on the order of 3dB or so and in that instance the Q1's drain current was increased substantially from the initial value, reminding me just how much variation there really is between individual JFETs of the same part number, from the same manufacturer, and from the same bag! Because no feedback is involved in the operation of the photodiode portion of the circuit in Figure 1, the detector has an intrinsic 6dB/octave amplitude rolloff characteristic above a few hundred Hz - the precise "knee" frequency depending on the the capacitance of the photodiode, the JFET and its cascode circuit, and stray circuit capacitances. To compensate for this rolloff, U1B, a differentiator circuit is used, flattening out the frequency response over the voice bandwidth. It should be noted that no real attempt was made to achieve maximally-flat frequency response, but rather a selection of components that yielded "good" sounding audio. Below the diode's "knee" frequency, however, the differentiator has the effect of acting as a highpass filter, reducing the level of low frequencies (those below 300 Hz or so) but this has little effect on the reproduction of speech. One advantage that it offers is that the strong fundamental frequencies associated with urban lighting (120 Hz and 100 Hz for 60 and 50 Hz power mains frequencies, respectively) are significantly reduced, offering some degree of prevention of overload of the audio amplification system used to listen to such communications: Without this filtering it is possible that when used near populated areas, the "hum" from urban light sources could overdrive the speaker amplifier before a comfortable listening level could be achieved! The U1B differentiator circuit also has built-in low-pass filtering, notably R10/C7 and R11/C8 in the feedback path. These components, along with R6 and C6, work together to provide high-frequency rolloff above 6-8 kHz or so - well above the majority of the speech energy. Were the differentiator not designed to have a reasonably high frequency cutoff frequency it would, in theory, produce a tremendous amount of high-frequency hiss owing to its 6dB/octave boost - something that would actually distract the listener. If a "flat" frequency response over a much wider range of frequencies (say, for use with a mechanical television system or with an FM subcarrier operating in the 10's of kHz) were the goal then the circuit around U1B would look substantially different, using a slightly different topology and different component values, depending on the specific need. At first glance of Figure 1 it may appear that the JFET's gate is floating: IT IS NOT! As can be seen in figure 2 the current increases exponentially with gate-source voltage in a "diode-like" manner. Like bipolar transistor, the drain current (akin to collector current) increases with gate current (akin to base current), but it's in linear proportion to the gate voltage rather than the gate current! This feature is due to the fact that the "gate-source" junction is conducting and is doing so in a classic "diode-like" manner. Under low-light conditions, the operational and leakage currents of the photodiode aren't enough to "saturate" the JFET and it continues to operate "normally" - even with a high (>100 volt) bias on the APD (Avalanche Photo Diode) used in a test receiver. If operated under conditions with higher ambient (or incident) light, the bias voltage should be reduced as much as necessary and R202 will provide ample protection to the Photodiode/APD and FET to prevent either from being damaged. It should be remembered that if there is plenty of "extra" light, the extremely high sensitivity of an APD-based isn't going to be required, anyway and one might be better off using a different (and less-sensitive) detector! Unlike many other optical receivers such as the K3PGP, VK7MJ and even the "non-daylight" Version 2 receivers which tend to "slam" to a supply rail and go mute, the "Version 3" circuit will operate to a degree even with extremely high light levels, albeit with altered frequency response and distortion characteristics as noted below. As far as is known, this circuit is one of the few optical receivers that is useful all the way from the smallest amount of light to full noonday sun where it has thusfar been used to span in excess of 20 kilometers (about 12 miles) with fairly good results! One peculiar quirk of this circuit at higher levels of ambient light is the fact that the frequency response becomes skewed and the audio will begin to sound distinctly tinny. The reason for this is that at higher levels of ambient light, the photodiode becomes more and more conductive, and as this happens the capacitance of the photodiode - the primary limitation of high frequency response - is increasingly shunted by the lower effective resistance, thereby improving high frequency response. Additionally, as the photodiode current (along with the gate current) increases, the gate impedance also drops, further reducing the effects of the photodiode's capacitance. Under very low-light conditions, the "knee" frequency is around 150-250 Hz for the BPW34 (depending on the photodiode's capacitance and the amount of reverse bias) and is generally unnoticeable (except as a slight lack of "bass" response) but with higher levels of light this "knee" moves well into the middle of the audio range where the post-emphasis effects of the differentiator become quite obvious in the audio. With the increase of ambient light comes a dramatic increase in noise as well - both from the photodiode itself (and possibly the JFET) and the source of ambient light. While this effect is, for all practical purposes, negligible in the voice frequency range at very low light levels, it will eventually become a roar of noise at much higher light levels - those at and beyond the point where the audio becomes "tinny." For this reason, if operating under conditions of high ambient light or where the transmitting station is backgrounded by some light, improved performance may result from adding a bit of optical attenuation to the receiver! Practically speaking, this effect has been most obvious when running short-distance paths (under 10 miles or 16 kilometers) using a 3-watt LED transmitter: One could modify the circuit to accommodate such shifts in the "knee" frequency (by modifying the R/C constants associated with U1B), but at such short distances it is usually more convenient to either reduce the power of the distant transmitter, put an optical attenuator (such as a piece of cardboard or "pegboard" with a bunch of holes in it) in front of the receiver's objective lens to reduce the amount of energy reaching the photodiode, or a combination of both. Comment: It would be a fairly easy matter to provide an extra control to adjust the "knee" frequency of the differentiator to manually compensate for frequency response differences as well as an extra resistor and capacitor to recover the "lost" bass response - but the low-frequency rolloff may be an advantage because of its tendency to attenuate 100/120Hz hum from AC-powered light sources. If properly biased, this receiver should function adequately under high-light level conditions where the ultimate sensitivity is determined by the presence of high levels of ambient light. As noted in the sidebar above, simply making the photodiode's reverse bias voltage adjustable can allow in-field optimization under such conditions! If a lower-capacitance photodiode than the BPW34 is chosen by the builder of an optical receiver, it should be noted that the "knee" frequency will likely be higher than the 200-300 Hz figure mentioned above. If one wishes to maintain a relatively "flat" frequency response over the speech range, it will be necessary to ascertain the new "knee" frequency of circuit with the chosen photodiode and modify the differentiator circuit (U1B) accordingly! As one might expect, the limiting factor of the sensitivity of this circuit is the noise intrinsic to the components being used - namely, D1 and Q1. As much as practical, these sources of noise are minimized, but it is not possible to eliminate them entirely. For the circuit in Figure 1, the differentiator limits the frequency response at the low end (below about 300 Hz) - but if one were to look at the "pre-differentiator" audio (e.g. the output of U1A) one would see that at very low frequencies (below a few 10's of Hz) that the noise would increase - largely as a result of the inevitable "inverse frequency" noise sources associated with any electronic device: In the circuit, these noise sources are made somewhat worse by the fact that the photodiode (D1) is reverse-biased, but since the intent was to optimize performance in the speech frequency range (roughly 300-3000 Hz) this is of relatively little importance. Looking at the "pre-differentiator" audio (the output of U1A) across the speech range, one notes the expected 6dB/octave amplitude rolloff of detected signals. If one looks at the noise floor, however, one sees that it rolls off, too, but not quite as fast. What this means is that given a constant input of an optical signal, the signal-noise ratio will decrease as the frequency increases. With the addition of the differentiator (U1B) the frequency response is constant, but instead of the level of our test signal decreasing, the noise floor will increase with frequency - eventually reaching a point at which the noise energy is equal to or greater than that of the test signal! Again, a "perfect" differentiator would have a 6dB/octave increase in gain up to infinity - which, of course is impossible, not to mention undesirable - but since we are interested in speech response, the differentiator's response is intentionally limited to a "reasonable" frequency above the speech range - specifically, around 6-7 kHz with the selected values of R9 and C6. To further reduce "noise fatigue" of the listener - and to better-remove high-frequency components of, say, a PWM-based transmitter, additional low-pass filtering is provided with the addition of C7/C8. U1B, the differentiator, effectively rolls off low frequencies below 200-300 Hz. Strictly speaking, it's actually the fact that the "front end" (the signal path up to the output of U1A) rolls off above this 200-300 Hz "knee" frequency interacting with the differentiator. Because of this, it is better to couple to the output of U1A (through a capacitor and series resistor of 47-100 ohms) for such "low" frequency use. If this is done, keep in mind that while the frequency response will be "flat" to 200-300 Hz, speech will be muffled or "boomy" as the intrinsic rolloff will attenuate the higher frequencies. Reverse the photodiode. That is, connect the cathode to the FET's gate. Ground the "cold" end of the photodiode - that is, the photodiode's anode. Increase the value of R4 (and the capacitance of C3 - removing J1, of course!) to effect a slight negative (relative to ground) gate voltage on Q1 - the precise resistance being determined on a "photon range" for best signal/noise performance. If this is done, note that higher-frequency (speech!) response will suffer even more. Also note that one might want to re-check Q1's drain current (doing so with very low test frequencies) to verify optimal signal/noise performance, especially since this can interact with adjustments of R4's value. Finally, be aware that such a configuration is far more sensitive to ambient light and even very small levels can completely saturate the detector! If one's interests are mainly frequencies below 200 Hz, the use of the K3PGP receiver (and its variants) is recommended - see this page for more information and links. Refer to the drawing in Figure 1 for the following discussion. Because of the lowpass response built into the differentiator (U1b) it will aggressively roll off frequencies above 10 kHz even if there is still high-frequency energy at the output of U1a. For speech purposes this was done to reduce "noise fatigue" and to limit the action of the differentiator at a reasonably high audio frequency (e.g. 5-7 kHz or so.) While the capacitance of the photodiode and related circuitry is the main limitation of the ultimate frequency response to the circuit, it is still capable of responding to signals into the 100's of kHz - albeit with lower effective sensitivity as the frequency goes up. If you wish to conduct experiments at higher frequencies than "audio" (e.g. above 5 kHz) then it will be necessary to obtain a signal that is not bandwidth limited - and such a signal can be found at pin 1 of U1 - the "flat" audio output. In reality, this signal isn't really "flat" as its ultimate frequency response is dictated (mostly) by the capacitance of the photodiode and its amplifier, but this port has nothing it in that would explicitly limit the high frequency response. It is at this point that one would connect the input to a VLF receiver/converter or FM demodulator if one wanted, say, to experiment with FM/SSB or other subcarrier schemes in the 10's of kHz range. The signal at this point is amplified only by virtue of the fact that the cascode stage (Q1/Q2) has significant gain of its own and is simply buffered (but not amplified) by U1a. In testing, there was "usable" output from pin 1 of U1a up to about 1 MHz or so using a BPW34, but the sensitivity was very significantly reduced at the rate of at least 6dB/octave above the "knee" frequency of the photodiode/JFET combination: For example, if the "knee" frequency were 500 Hz, the sensitivity - from the R/C rolloff alone - would be reduced by nearly 70dB by the time you got to 1 MHz! Bypass (or modify) the U1B differentiator circuit. As noted, the differentiator is intended to roll off both low (<300 Hz) and high (>6 kHz) frequencies and the "Flat audio Output" does this. Alternatively, it is possible to modify U1B's operational characteristics to extend the high frequency emphasis even higher: You can send an email to me using the link at the bottom of this page for more details. If you use the "Flat Audio" output, note that the audio isn't really "flat" at higher frequencies (e.g. those above the "knee" of the photodiode circuit) but still roll off - but they are not low-pass filtered as they would be in the case of the differentiator. Use higher reverse bias voltage. A higher reverse bias will reduce the diode's capacitance and improve the frequency response. The amount of added noise due to diode leakage will be of little consequence as that is most dominant at lower frequencies (below several hundred Hz) and the fact that as the frequency goes up, the diode's capacitance shunts signals anyway. With a higher bias voltage comes a penalty in that the receiver is less-able to deal with ambient light conditions as this tends to increase photodiode conductivity which can more-easily saturate the amplifier: In extreme cases AC coupling (see an example of this in Figure 2) may be used at the expense of the loss of ultimate sensitivity - but since sensitivity is reduced at these frequencies anyway, the tradeoff will probably be worth it. Use a smaller photodiode. A smaller-area photodiode has less capacitance. Also, remember that the smaller the diode, the lower its capacitance - and the better the high-frequency response. When reducing the size of the diode one must make sure that it is still large enough to accommodate the "blur circle" of the lens being used (see the "Fresnel Lens Comparison" page for additional info. about the "blur circle") and that field of view with the lens/diode combination is appropriate to your needs, plus it is important to note that if it is also used for speech purposes, you may want to tweak the values around U1b (if you do, in fact, plan to use it) to flatten the frequency response a bit. If the photodiode is smaller that the blur circle of the lens, some receive efficiency may be lost as some of the light from the far end is "missing" the photodiode - but this may be an acceptable tradeoff for improved high frequency response. Use an Avalanche PhotoDiode (APD). These devices have their own self-amplification, but they can be rather expensive - on the order of $150USD for a diode with a 1mm2 active area - and they need a rather high (100-300) bias voltage to work at maximum gain! The diode's self-amplification can be used to overcome the R/C losses and amplifier rolloff and in a test circuit, reasonable sensitivity was obtained at 2 MHz using an modified version of the circuit in Figure 7 with an APD. Additional information about the use of an APD may be found below. When sizing the photodiode, note that smallest size that may be used is limited by the "blur circle" of the lens being used. Modify the cascode and buffer amplifiers. Eventually, the amplifier itself will start to limit frequency response - but this effect is likely to be less severe than the R/C rolloff at the photodiode. In particular speed of the cascode circuit would need to be increased and this is most-easily accomplished by decreasing the value R6. Doing so will decrease the gain and slightly increase the FET's current so some commensurate adjustment of R5 may be necessary to prevent the FET from "seeing" too much current. At least some of this gain may be made up by increasing the power supply voltage to 12-15 volts which also improves the operating margin of the LM833 - but going too high could cause the circuit to become unstable. The LM833 is a fairly decent amplifier for this application as it has good, low noise properties and an excellent unity-gain bandwidth for a garden-variety amplifier - on the order of 15 MHz which is higher than the much noisier TL072! If high gain/high frequency is your ultimate goal, there are special high-speed op amps out there that will run circles around the LM833 - but you'll need to look for them! Resonate the photodiode. One "trick" often employed is to place a resonant circuit across the photodiode. This would use the capacitance of the photodiode on conjunction with a parallel inductor to form a tuned circuit that was resonant at the frequency of interest. The disadvantage of this is that it tends to be rather narrowbanded and additional noise can be introduced with the inductor. Since neither the photodiode or the external coil have pure reactances (that is, some loss is involved) they can contribute additional noise. If broadband response is needed (e.g. video or high-speed data) the "Q" of the circuit may prevent good performance, although the "Q" could be spoiled somewhat with the use of a paralleled resistor - but this adds back losses and adds the noise generated by the resistor - either of which can degrade performance! Again, if you do use a resistor, use only a metal film device to minimize noise contribution. Use a TIA. At some point it may be better to simply use an TIA - a TransImpedance Amplifier. The circuit shown in Figure 3 uses feedback to compensate for the capacitance of the photodiode and can achieve good frequency response - but it, too, does so at the sacrifice of ultimate sensitivity, but it may be better-suited overall, especially if your needs are for a broadband response. Many of the tricks noted above will apply to this circuit as well. If you are an avid builder, you have probably noticed that over the past several years, through-hole JFET transistors have almost disappeared from the catalogs of manufacturers current offerings! You used to be able to buy the venerable MPF102 from any number of places for a low cost, made by a lot of different manufacturers, but nowadays, you have to resort to surplus places or even EvilBay. The "problem" with Ebay is that unless you buy from a reputable vendor, you are never quite sure what you are getting - even if the parts that arrive have a particular number stamped on them! Such is the case for the transistor described here, the 2N5457 as this, too, has disappeared from the catalog in the through-hole version - but it is still available in the surface mount version: Look for the MMBF5457 (the suffix will vary). Don't let the idea of a surface-mount part scare you: Just use a good pair of glasses, a fine-tipped soldering iron and some tweezers - and buy a few extra transistors. Why would you want to operate a "subcarrier" at higher frequencies? As has been noted, ultimate sensitivity will be reduced as the frequency increases due to device/circuit capacitance - so why would one use a subcarrier? If the optical path crosses urban areas, the "baseband" frequency may contain mains harmonics (of 100 or 120 Hz) from urban lighting that can degrade signals. These harmonics tend to be strongest at the lower harmonics (300/360 Hz) but they diminish as frequency increases, so "shifting" the audio up by several kilohertz may move things away from the frequencies containing QRM. Again, doing so will likely reduce ultimate sensitivity by 10-20dB - particularly if FM is used - but if one has plenty of signal available - such as the use of a fairly short path - then this may be an acceptable tradeoff. You'll probably need to build an "AM" (e.g. "baseband") transmitter and receiver anyway to connect it to your FM modulator or SSB transverter/exciter/demodulator, so it would be worth the minor inconvenience (adding a switch or two!) to be able to switch between "AM" and "Subcarrier" mode. You will need to build "extra" gear in addition to the LED transmitter and optical receiver to do the FM/SSB generation/conversion on transmit/receive. If you are handy with building this, then that's fine, but remember the "KISS" principle! Expect that ultimate sensitivity will suffer significantly. Again, if your link needn't be the highest-performance (e.g. rather limited distances involved) then all of this may be an acceptable tradeoff. You can find, on the web, a number of schemes that use FM subcarriers - most of them being examples of poor design - but one of the best-conceived of these circuits is this one by Max Carter. Typically, an FM carrier is modulated at a frequency between 20 and 100 kHz - well above the baseband. As can be seen from the linked article, modulation is pretty easy, but efficient demodulation is a bit trickier: If one wants a high-performance system, bandpass filtering of the carrier is important and every feature you add contributes a bit to overall system complexity. It is possible to use a receive converter (such as one intended for "VLF" - Very Low Frequency - use) along with a communications receiver (such as a ham rig) that has FM and demodulate using that: This has the advantage the the performance of such a receiver, with its built-in filtering, is likely to work much better than a simple PLL-type FM demodulator that one might build to operate at the subcarrier frequency itself. If you go both ways, you can use the ham rig to both receive and modulate a carrier if you have a "transverter" available - but all of this assumes that you have a transceiver that can do this along with you! Again, with the higher frequency, performance degrades, but if your link can tolerate 20-30dB reduction in effective sensitivity, you can achieve excellent fidelity. As was mentioned above, if you have a transverter (e.g. a "transmit/receive converter") you can use an existing amateur rig to modulate and demodulate the signals. In addition to FM, you can also use other modes available to you - which may include SSB. The advantage of SSB over FM is that it takes much less bandwidth (about 1/6th) and this in combination with the very nature of SSB means that signals 10-15dB weaker than FM can be detected: As long as the FM signal has a 10dB or so signal-noise ratio, it will be reasonably well "quieted", but the trained ear can copy an SSB signal that much weaker and is very near the noise! Since SSB requires a lower bandwidth than FM (e.g. 2.5 kHz versus 15 kHz) you can actually set the SSB "carrier" frequency much lower than with FM - as low as 3-5 kHz if the transverter is properly designed - which minimizes the amount of sensitivity reduction due to device capacitance in the optical receiver. SSB has the advantage of efficiency over FM owing to the fact that it is, in fact, only as wide as the audio signal itself and could be considered to be the AM voice "baseband" frequencies simply shifted up. With the use of an SSB signal and a well-designed mixer (e.g. one that is well balanced and has minimum "bleedthrough" of the local oscillator) it is possible to make use of the radio's noise blanker to reduce effects of AC-induced noise as well as the radio's DSP filtering - if it has the capability, that is! One advantage of SSB is that DC power to operate the transceiver is reduced on the optical transmitter since, unlike AM or FM, no "carrier" (constant light) is required during periods of no audio. Again, the use of SSB or FM would imply that one has equipment to use and could be - as suggested - be in the form of a VLF "transverter" to work with one's portable HF multi-mode transceiver. Of course, all of this assumes that you have a transceiver to use and have built the necessary converter gear to go with it. Again, since higher frequencies are used, expect 10-20 dB reduction in effective sensitivity, but if your link isn't all that far (a few 10's of km) then there should be enough margin under "clear air" conditions. A few additional comments on modifying the circuit for higher-frequency operation may be found here. Ron, K7RJ, has been helpful in the testing of the "Version 3" receiver design for several years, having been involved in many of the short and long-distance communications experiments. Because of his interest, he has done something that I have not: Designed and laid out a circuit board for the receiver. Using an "online" circuit board manufacturing house, he has also had several boards made for these receivers, which have also been tested. Furthermore, Ron has put together a web page that has documented his efforts and includes information on how you can get boards made. Note that the schematic on Ron's page differs in some very minor ways with the one shown in Figure 1 (above) and that parts designations (e.g. "R1", "C5", etc.) are different, but all of the other comments about the circuitry made on this page apply to his version - with the appropriate parts translations, of course! Also note that Ron is NOT set up to supply people with boards directly, but this page provides all the information needed to download the design, download the (free!) board layout program, and get you to the point at which you can take your credit card and get some boards (6 of them) made for you and your friends! Also included on this page is a parts list and a few pictures pertaining to some of the more-important details of the receiver's construction. Note that Ron's page includes several pictures and practical advice pertaining to how the photodiode is to be mounted: These techniques are valid no matter what means of construction you end up choosing! Impedances, especially around D1 and Q1, are extremely high! Excess lead length not only increases the possibility of the pickup of stray signals (such as hum!) but it also implies higher capacitance - something that you want to minimize! In a circuit such as this were there is both high impedance and sensitivity to capacitance, this circuit can become "microphonic" - that is, it will respond, electrically, to mechanical vibrations - like a microphone. This is an unavoidable result, but keeping leads fairly short and using mechanically solid mounting for the most sensitive components can greatly minimize this! This circuit should be shielded. As mentioned before, the extremely high impedances and sensitivity involved make it susceptible to being affected by stray fields - which could be RF, electrostatic or magnetic. While the aforementioned "high frequency" wiring techniques go a long way to preventing problems, it is still a good idea to enclose the circuitry in a metal box and, if practical, bypass the signal leads going in and out to prevent conduction of signals on these leads into the circuitry - especially if you are planning to use transmitters (e.g. handie talkies, cell/mobile phones, etc.) anywhere nearby. The connection between the anode of D1 and the gate of Q1 should be done in the air, and be kept as short as possible! Due to the extremely high impedances, combined with low signal levels, there should be nothing else connected at this junction! One should take care that this connection is kept free of flux, dust, and other contaminants, as these can cause leakage paths - which can contribute noise! Clean the junction with denatured alcohol when you are done to remove contaminants. Do NOT make this connection using a circuit board trace or pad! Doing so will not only add capacitance to this portion of the circuit, but it also be a potential leakage path - a noise source! For pictures and descriptions on how to properly mount and connect the photodiode, see Ron's web page referenced in the sidebar above. With the components shown in Figure 1, the circuit is designed to operate properly from about 8 volts to 12 volts. At and below 7.5 volts, the receiver performance begins to degrade, so one should keep spare 9 volt batteries onhand! Note that the front-end circuit (Q1, Q2, Q3) does not have good power-supply rejection which means that any hum or audio that is riding on the power supply you use will likely appear in the audio output. This can become an issue if an AC-operated supply is used and/or if an audio amplifier or other device is operated from the same supply as the receiver. When the supply voltage rises above 12-13 volts, instability arises in the cascode circuit: If one anticipates operating exclusively at such voltages, the resistor values in the cascode stage should be adjusted - or simply add a regulator to keep it in the 9-10 volt range! Note that only the "front end" portion of the circuit (Q1, Q2, Q3) would need to be regulated in such cases as the op amp (U1) will happily operate at these higher voltage and provide good power supply immunity! Using a fresh alkaline 9 volt battery, the receiver typically draws between 10 and 20 milliamps with the component values shown in Figure 1. It is recommended that this circuit be operated on its own, independent power supply! If you decide to run this circuit from the same power supply as the speaker amplifier, transmitter, etc. then you are asking for trouble as mixing an extremely sensitive receiver with the possibility of ground loops is a recipe for disaster! Remember: 9 volt batteries are cheap! Testing has been done with a modified version of the described circuit using APDs (Avalanche PhotoDiodes) with good results as documented on the page, an APD-based optical receiver for Speech Bandwidth Communications. Remember to bring spare batteries with you! On more than one occasion we've forgotten to turn off the receiver when we were done, finding a dead battery next time we tried to use it. Fortunately, we have (thusfar) followed our own advice! It is recommended that you NOT put this receiver in the same box with any other circuitry - especially an audio amplifier and/or speaker. As mentioned above, the audio-modulated currents from an audio amplifier will likely find their way into the ultra-sensitive front-end - plus the fact that the receiver itself will inevitably be somewhat microphonic and pick up the speaker's vibrations, likely resulting in feedback! Less concern with 1/F-type noise. This type of noise sources increase with decreasing frequency, becoming most severe at very low (<100 Hz) frequencies. With a high end of only 3000 Hz or so, we need not be as concerned with making sure that our frequency response extends much above this. As it turns out, the above two points actually have something to do with each other: One of the main limiters in the upper frequency response of an optical receiver is the intrinsic frequency response of the detector being used. Let us take, as an example, the BPW34 PIN photodiode. This is an inexpensive device ($1.00 US or less in small quantities) that offers reasonably good performance. It is also a "medium-area" photodiode - that is, it is neither very small or very large, having an active surface area on the order of 7.5 square millimeters. One unchangeable fact is that the larger the diode, the more self-capacitance that it exhibits. In the case of the BPW34 at zero volts, it has a capacitance of around 70pF. While this amount of capacitance may not sound like much - especially at audio frequencies - one must appreciate the very high impedances involved. For example, if the circuit's impedance were about 10 megohms, one could reasonably expect that frequencies above about 225 Hz would be attenuated at 6dB per octave. When one is trying to detect extremely weak signals the primary limitation of the detection system is likely to be noise: If the level of the signal being sought is below that of the intrinsic noise of the receiver itself, it will be lost! It makes sense, then, that in a receiver system, that one try to preserve as much of the original signal as possible. As can be seen from the above, by the time we reach 225 Hz, the signals impinging on the photodiode are already being attenuated and dropping toward the noise floor! The caveat to increasing the bias voltage on the photodiode is that leakage currents also increase - which also results in increased noise! Fortunately, the majority of this increase in noise occurs at low frequencies, mostly below 300 Hz, so it has only minimal impact on the higher (speech) frequencies. For the most part, the increase in the diode's noise at speech frequencies caused by the higher bias voltage is much less than the amount of signal gained by the reduction of the device's capacitance! Why not use a feedback amplifier? Typically, a TransImpedance Amplifier (TIA) is used in conjunction with a photodiode for detection of weak signals. When properly designed, this offers flat frequency response up to a "knee" frequency - which is dependent, in large part, to the amount of feedback being applied and how it relates to the photodiode's capacitance. In this way, the effects of the diode's capacitance on frequency response can be greatly mitigated, as it is the properties of the photodiode and the amplifier's closed loop gain and the compensation of that loop that establish the available bandwidth. If you needs require flat frequency and phase response above ultimate low-bandwidth sensitivity, a TIA may be the better choice. While a TIA is an attractive option, it has the downside of requiring the addition of additional components in the signal path - each component being a potential source of noise. For example, a TIA circuit has a feedback resistor through which current flows to close the loop - but not only does the current flowing through this resistor produce noise on its own, but noise produced by the amplifier circuit itself (and its associated components - including the feedback resistor) is also fed back into the input, further contributing to signal degradation. Generally, when building a TIA one uses a low-noise operational amplifier. As it turns out, however, even specialized "low noise" op amps can be noisier in this situation than a discrete junction FET device! For this reason, it is not uncommon to see extremely low-noise TIA circuits that use low-noise op amps preceded by garden-variety JFETs - or even ones that avoid the use of op amps entirely. Photodiode Amplifiers - Turning Light into Electricity - From National Semiconductor, an online seminar about various aspects of using photodiodes and how to amplify their output. This page links not only to some .PDFs of slides and transcripts of the seminar, but it also has an online video of the original presentation. Related to this topic is National Semiconductor's application note AN-1244 which also contains information about this same topic. "What's All This Transimpedance Amplifier Stuff, anyway?" - This is an article by Bob Pease that appeared in the January, 2001 issue of Electronic Design that discusses, among other things, the sources of noise in transimpedance amplifiers and techniques to deal with it. Low Noise Amplifiers for Small and Large Area Photodiodes - This design note covers general aspects of transimpedance amplifiers. Fast CMOS Op Amp Challenges Bipolar Amps on All Key Specs - This paper overlaps many of the topics in the above paper, but has more-general info. 1 - Diminution of receiver sensitivity at higher frequencies in an inevitable consequence of the capacitance of any photodiode/amplifier circuit. Typically, a "TIA" (TransImpedance Amplifier) circuit is used in wide-bandwidth receivers and a combination of feedback signals and capacitance is used to flatten the frequency response as it goes up - but this does not necessarily improve high frequency sensitivity! What it does do is "flatten" it out - but once the you get past the design frequency response of the TIA, rolloff occurs. In the "Version 3" non-feedback circuit described here, NO feedback is used so the frequency starts rolling off immediately - past several hundred Hz, typically. With proper design, however, while the absolute signal level may drop with increasing frequency, it will still be present. Without additional feedback circuitry, however, it may be that the signal-to-noise ratio at higher frequencies may be better with this circuit than with a TIA circuit as there are fewer components and signal paths that can degrade the overall signals. In other words, if its not particularly important that the amplitude response be perfectly flat, this circuit may suffice. An example of this would be the use of an FM or SSB subcarrier above the speech frequency range (e.g. above 3 kHz or so) in which some amplitude rolloff with frequency isn't going to be a particular problem. It is worth mentioning that possible to "tweak" the circuit in several ways if one wanted to forgo the use of "Speech Range" operation in favor of higher-frequency (>5 kHz) operation. If you are interested in this sort of operation, you can contact me at the link below.